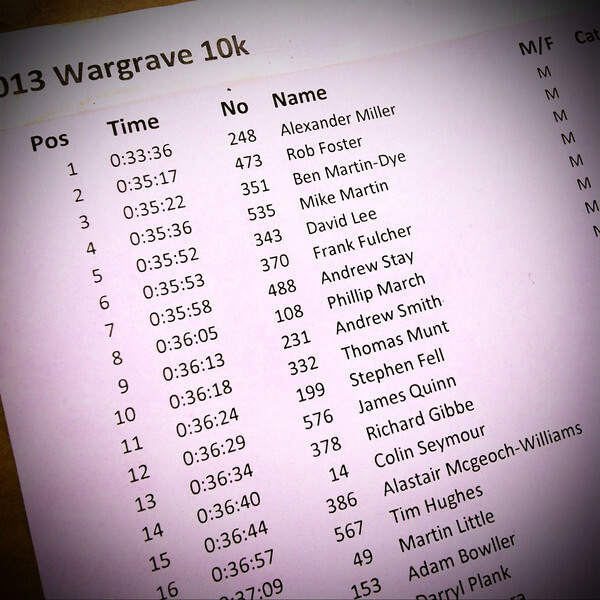 I had a cracking race at the Wargrave 10k today. I went in with a goal of sub-38 mins with a planned negative split as the only real hill is between 3 and 4ks. Ran 18:45 for the first 5k and 17:53 for the second 5k (my fastest 5k this season) bringing me home strong in a new PB of 36:38 according to my watch. Gun time as you can see in the photo was 36:40 and I suspect chip time may be slightly quicker than 36:38. Interesting that my race number and finishing position are both 14. It can't be often that this happens to non-elite runners. Chuffed to bits and in retrospect I think I may have been able to go even quicker. Now I'm off to Waitrose for some treats for lunch and then to the pub for a reward beer or two. Off to India tomorrow so it'll be interesting to see what running I manage to squeeze in. Update: official results are in and my chip time, and thus new PB, was 36:36.